A Traffic Police personnel towed away a car with a sick woman sitting in the rear seat and breastfeeding her seven-month-old baby. MUMBAI: Hours after a video showing Mumbai Traffic Police personnel towing away a car with a sick woman sitting in the rear seat and breastfeeding her seven-month-old baby went viral, a policeman was on Saturday suspended, pending an inquiry. Meanwhile, another video capturing yesterday’s incident of a car being towed while a woman was breastfeeding her baby inside it, has surfaced today, turning the whole argument over the incident on its head. 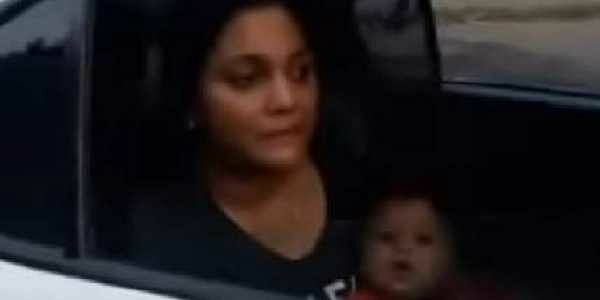 It shows that the seven-month-old baby was not inside the car but in the arms of another family member when the Mumbai Traffic Police warned to tow it away. The infant was taken inside, thereafter, indicating that situation could have been averted, on part of the parent. The incident occurred on Friday evening on the busy S.V. Road, in Malad (West), north-western suburb, and a video of the incident made by a local citizen, said to be her husband, went viral on the social media on Saturday. "Prime facie, it has been noticed that the safety of woman and child was endangered in the said incident. Hence, pending inquiry, the constable has been placed under suspension. Decision about departmental action shall be taken after the inquiry report is received," he said. According to information, a young woman in her mid-20s, whose identity is not available, was sitting in her white car with her seven-month-old child when a towing van suddenly picked it up and started towing it away. She begged and pleaded to stop the towing with the towing officer -- a traffic policeman believed to be named Shashank Rane, who was not wearing his name badge while on duty, which is also against the rules of the Maharashtra Police. Following strong all-round condemnation, protests and adverse publicity in the social media to the video posted by a user "Rakhi Rakhi", the Traffic Police Department on Saturday ordered a probe into the shocking incident.